From its sanctuary to its logo, the Aldersgate ReNew Campus in Wichita is determined to be a hybrid of the traditional and the modern. “There’s a balance there,” said the Rev. Jordan McFall, pastor of the satellite campus that opened the weekend of Sept. 17-18 with a block party on Saturday night and a contemporary worship service, followed by pizza, on Sunday. 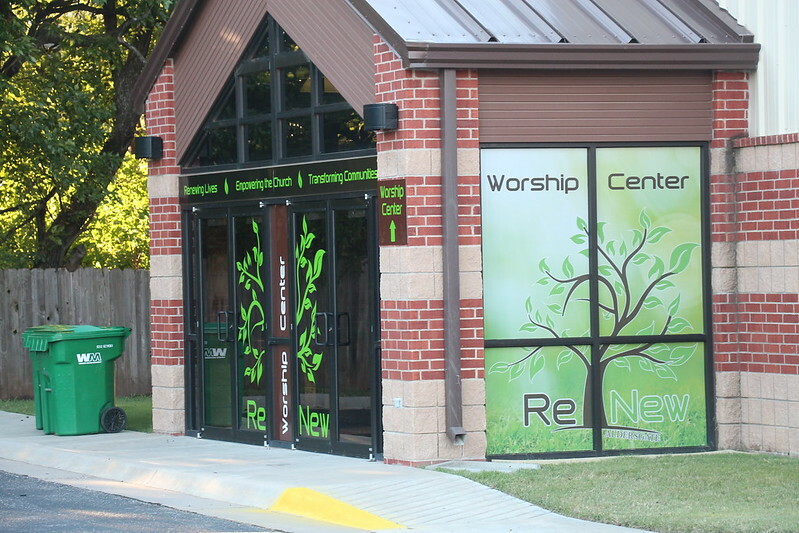 More than 160 adults attended the first service at Aldersgate Renew, 11215 W. 13th St. N.
ReNew takes place in the building that formerly housed At the Well, a United Methodist Church commissioned five years ago by the former Kansas West Conference. At the Well had its roots as a contemporary service at Aldersgate, then spun off into its own church. The 29-year-old McFall, a native of nearby Rose Hill and business major at Kansas State University, has been associate pastor for two years at Aldersgate. He said ReNew is trying to balance the established parent church’s name with a creative flair to promote its new congregation. The church’s logo, a sprawling tree with sprouting leaves, includes the Aldersgate name on the tree trunk, and one of its branches forms a capital “A.” Wristbands promoting the church show the “ReNew” name in green on the top, with the Aldersgate name and the United Methodist cross-and-flame logo on the bottom. ReNew’s worship center has an open-stage concept, but two traditional elements – a pulpit and a communion rail – have been added. The wood-and-steel design on each also includes wheels, so they can be pushed away or brought out as needed. A survey of area residents, McFall said, shows that 45 percent of them wanted to have some sort of traditional elements in a church service. The worship center has seats for 250, with chairs that have gone unused since At the Well closed in the spring. When new lighting was installed, he added, team members realized there was still more cleaning that needed to be done on the seats. The other new addition is a coffee bar in the church’s lobby, with two coffeemakers and a year’s supply of java donated by the Kwik Shop convenience store chain. Smaller repairs to the outside doors and the heating and air-conditioning units have been made since At the Well closed, McFall added. McFall said Aldersgate has discussed a satellite campus for several years, and he was in the Great Plains Conference’s Church Planter Incubator and Crucible training last year to gain strategy and inspiration in finding its second home in Wichita. When At the Well, about 3 miles away from Aldersgate’s 21st Street location, became available, it seemed like a logical move. “Our leadership team’s hope and prayer has been that being a satellite campus and having the support staff of 21st Street, having the healthy systems that are there being duplicated here rather than just doing our own thing,” McFall said. Not only has he moved over from the main campus, but the church’s director of Christian education, Cynthia Rios, has been made full time and developed a Sunday school program for ReNew. In the Sunday school, youth are rotated to various stations week after week, using cooking and science, video and storytelling to convey a different Bible lesson each month. ReNew is getting the word out in various ways. It blanketed the area with post cards inviting area residents to the Sept. 17 block party and Sept. 18 worship, spread yard signs throughout northwest Wichita and armed its startup staff with business cards promoting ReNew and getting their names and contact information for an email blast. It will also have booths at community events, and will pass out foam “No. 1” fingers at a Goddard Eisenhower football game this fall, with the Tiger mascot on the front and ReNew’s logo on the back. Besides the mix of traditional and contemporary in its worship, McFall said that two concerns of those in the area were financial issues and health. ReNew is planning on a session of Dave Ramsey’s Financial Peace University (already a hit at the Aldersgate main campus) and will consider a “worship and yoga night” sometime in the future. In its northwest Wichita neighborhood, McFall said, the two growing demographics are young couples with preschool and school-age children, and those 62 years and older – at or near retirement and downsizing into smaller homes in the area. Aldersgate already has a healthy attendance at its three Sunday morning services. McFall said he wasn’t sure how the new congregation would be composed, between current Aldersgate members, formerly unchurched in the area, and those moving from other congregations. He leads a 14-person team of volunteer lay member who are “leading in greater ways than I am.” They include Aldersgate members and three former parishioners from At the Well. “There’s been a lot of prayer and a lot of discernment and a lot of work together as a team, envisioning a place where people from all walks of life can come and be comfortable and be together and leave renewed, experiencing Jesus and the Holy Spirit in their lives,” McFall said. The Rev. Nathan Stanton, new church development coordinator for the Great Plains Conference, said that creating satellite campuses has become the preferred method of starting a new church rather than “parachuting in” and starting from scratch. “You’re immediately able to replicate the healthy DNA of another church that is strong,” Stanton said. “Part of doing a satellite is assessing the strength of a potential parent congregation – their sense of mission, their strength of vision for their own community. “There’s a sense that it fits,” he added. Satellite campuses are generally found in larger cities, Stanton said.